A cryptocurrency exchange is an online marketplace where investors can buy and sell digital assets (similar to a stock exchange but with digital coins). Of course, one person can send Bitcoin to another directly, but to buy and sell such assets on the market, an investors needs to use an exchange. Crypto exchanges allow transactions from one digital currency to another, as well as to or from different fiat currencies. Agencies such as the SEC and FINRA are increasingly regulating crypto exchanges. Some exchanges have even voluntarily sought out fully regulated status to adopt a policy of transparency that sets them apart in this nascent industry. Exchanges charge fees every time a transaction is made. If you’re working with a crypto custodian to buy Bitcoin in your IRA, for instance, there will still be a fee from the exchange. 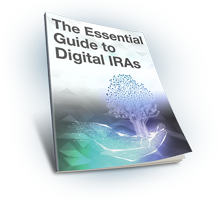 Keep fee structures in mind when choosing a Digital IRA services company. Asset Variety – Offers exposure to all major digital currency markets. Unrivaled Speed – Transactions are executed instantly and settled on the same day. Established Experience – Has mediated nearly $1 billion in transaction volume over the course of several years in business. Maximum Liquidity – By maintaining one of the largest networks of trading partners in existence today, our partner ensures that you’ll always have access to a deep pool of liquidity. This helps to prevent your trade orders from falling behind the market while waiting to be filled.